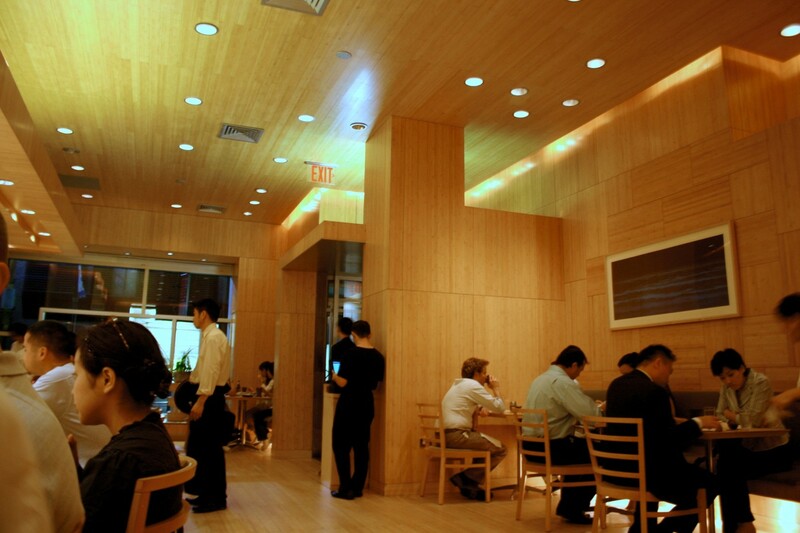 There are three simple rules for having a mind-blowing eating experience at Sushi Yasuda: 1. Sit at the sushi counter. 2. Order the omakase. 3. Sit back and enjoy. If you want to complicate things and add a fourth rule, we’d recommend closing your eyes while you chew. You’ll look like an idiot, but you don’t want anything distracting you from this fish. Yasuda is known for having some of the best sushi in the city, so we came in expecting a lot, and it still blew us away. The rice is excellent - slightly warm with just the right amount of vinegar. And we think it goes without saying that the fish was perfect, but we’ll say it anyway - the fish was perfect. When you sit down, you’ll be handed two things: a short menu that features a few kitchen dishes and drinks, and a sheet featuring the day’s sushi choices. The sheet will likely have fish on there that you’ve never heard of before, unless you majored in marine biology. No worries. Just say “I’ll have the omakase,” and the chef will serve you about 20 pieces of the best fish they have that day. Depending on what you get served, it will cost somewhere between $100-130 per person before drinks. And it’s worth every penny. If you’re not that adventurous or are saving up for a special occasion (although you should really save up for this special occasion), you can also order a la carte. But be warned that although the a la carte menu doesn’t look that pricey, the pieces of sushi are pretty small, and it will take quite a few to fill you up. After our 24-piece omakase meal, some of us could have kept going for another 10 pieces or so. My credit card company wishes I had. Now I just have to figure out who to call about this interest rate. I’m not even sure Discover has a phone number anymore. While the fish was fantastic, the overall experience wasn’t perfect. The service was very rushed. We were seated at 9:30, and we were finished, paid, and standing outside by 10:35. That’s a quick window in which to eat 20+ pieces of sushi, and especially quick if you consider what that means you’re spending per hour. The chef served the pieces two at a time, which pressured us into eating the first one quickly so we could get to the second before the fish warmed up and the rice cooled down. Even worse, one of the sushi chefs had customers who finished before we did. He took off his chef’s coat, stripped down to his undershirt, and starting cleaning his station. While we were still eating! Nothing encourages an appetite like watching a skinny-fat Japanese guy’s gut jiggle while he scrubs something. On the other hand, the restaurant was filled some extremely good-looking people, so we’ll call that a push. We were pretty sure that the girl sitting next to us was on one of those ABC Family shows that people in their twenties watch. Can someone invent a Shazam for celebrity faces? It just goes to show that if the fish is good enough, people will gladly eat dinner two blocks east of Grand Central. Well, at least marginally famous people with TV sitcom salaries will. This was so good that we asked for an additional piece when our omakase was over. We had no idea that scallop could taste this good. Anything preceded by the word “King” should be delicious, and this is. This is another one that we ordered an extra piece of. Yasuda has multiple types of eel, and they’re all excellent. Try both the sea eel and freshwater eel, and don’t expect them to be coated in the BBQ sauce they use at takeout sushi places. Possibly the best roe we’ve ever eaten. It tastes like they soak the eggs in butter before they serve them. Absolutely excellent. If you don’t like Uni, this could make you a convert. Of course the tuna here is great. We just hope bluefin doesn’t go extinct before our children get to taste it.